At Prime Stables, we understand the benefits of internal stables and we know that horse owners are passionate about providing the best accommodation possible for their horses. A safe and welcoming stable area helps give your horse a secure space in which they can feel protected. At Prime Stables, we know that every horse is unique and will require something different from a stable. Our bespoke approach to internal stable designs and installation offers you the flexibility to ensure you’re making the best possible choice for your horse. What is an Internal Stable? Internal stables are, as the name suggests, internal or inside a building. They are specially constructed stable that are either built inside an existing building or as an independent structure. They tend to house multiple horse stalls and food storage areas. You can even incorporate tack/feed rooms into the rear of each box, if needed. At Prime Stables, we are increasingly finding that many of our clients are converting their existing farm buildings into internal stables for equestrian usage. Internal stables are popular for numerous reasons, let’s look at some of them now. Internal stables offer fantastic protection from harsh weather conditions for both you and your horse. An internal stable ensures your horse is not exposed to harsh winters, excessive rain, storms or the blazing sun. This is also beneficial for those caring for the horses, as it means you can feed and groom your horse in a protected, warm and dry environment. Internal stables can also be partitioned to ensure each horse has plenty of clean, dry space to lie down and rest. Internal stables ensure that stalls remain dry – even in the worst weather conditions. Stables must be safe environments for your horses. They must ensure your horses are kept safe from theft, stormy weather and other animals or horses that threaten them. Internal stables are designed to be safe environments in which your horses can be protected from theft and lower-status horses can’t be bullied by other herd members, helping reduce their anxiety. Horses are herd animals, they don’t like being alone and they thrive off of being social. Don’t believe us? Check out our article on ‘7 Ways to Keep Your Horse Happy’ to find out more. Horses enjoy being together and internal stables allow them to do just that. Each individual stall is located to the next with bars, windows, or low partitions for the horse to see over and interact with each other via. This allows you control over the interaction your horses have with each other. It also means you can separate horses causing trouble or bullying other horses. Internal stables are a great way for your horses to socialise in a controlled social environment where they feel safe and protected. For owners of horses, internal stables have an array of different benefits – one of them being easy cleaning. Ensuring your stables are kept clean reduces the risk of infections, health problems and discomfort experienced by your horse. Thankfully, internal stables are easy to clean and can be managed easily because everything is in one place. Internal stables allow for easy access that is beneficial for both you and your horses. Individual stalls can be accessed quickly through sliding or hinged doors and windows are available to provide fresh air and effective ventilation. Easy access makes moving your horses in and out of the stables significantly easier. Internal stables are extremely beneficial for daily health inspections as everything – including your horses – is all in one place. This makes daily monitoring, health inspections and feeding significantly easy to carry out. The food consumption and manure of each horse is also visible and is therefore easy to monitor if they are unwell. Here at Prime Stables, we manufacture and build wooden internal stables for horses. We provide a range of stable solutions for equestrians all over the country, including internal stables. We deliver and install internal stables throughout England, Scotland, Channel Islands, Wales, Ireland, France, Belgium and other countries in mainland Europe. We always build our stables from environmentally friendly material to the highest standard possible. Our team of professional builders are fully qualified and experienced, working with you from start to finish of your stable project. 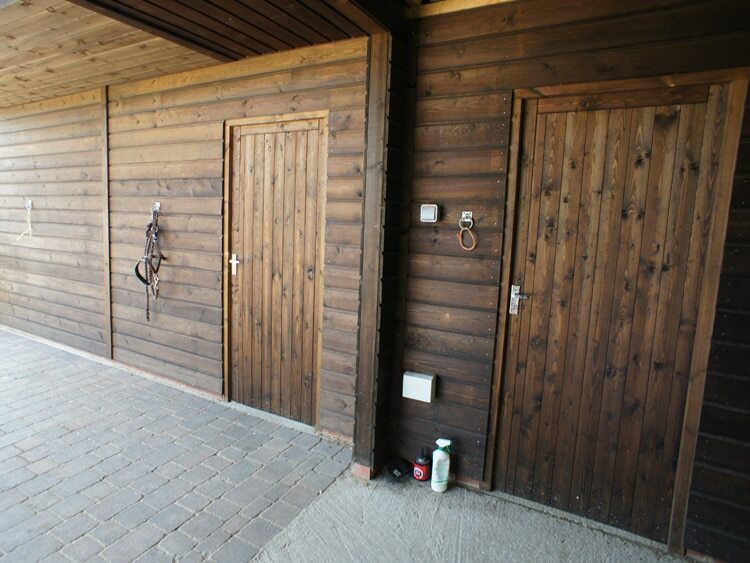 If you have been thinking about installing internal stables, look no further than Prime Stables! We have made it our mission to provide you with internal stables to meet your every need. Whether you want us to work with your existing space or build a completely new equestrian complex, we can make your requirements a reality. Our stables are built to order and can be made in any size required. During the design process, we work with you to ensure you get internal stables that meet your requirements. Working with the finest materials, we create internal stables that are unique to you and exceed your expectations! If you require internal stables, call our team today to discuss your options, we would be more than happy to talk with you!